Eight films presented at the last edition of the San Sebastian Festival were acknowledged with 16 accolades at the 33rd Goya Awards. El Reino (The Realm), selected for the Official Selection, was the big winner of the night with seven awards. The film by Rodrigo Sorogoyen won the awards for Best Director, Best Original Screenplay, Best Leading Actor (Antonio de la Torre), Best Supporting Actor (Luis Zahera), Best Editing, Best Sound and Best Original Score. Quién te cantará, which also competed in the Official Selection, received the Best New Actress award for Eva Llorach. 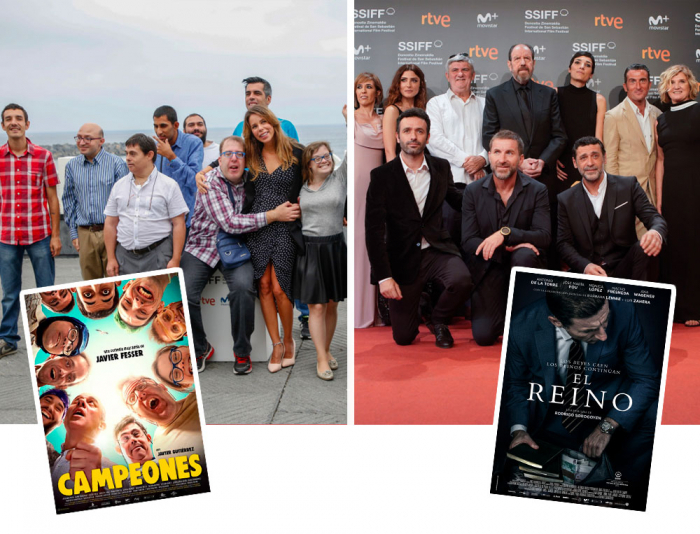 Campeones, screened at the Velodrome together with the documentary Ni distintos ni diferentes, landed the Goyas for Best Film, Best New Actor (Jesús Vidal) and Best Original Song. The Best Animated Film award was collected by Un día más con vida / Another Day of Life, directed by Raúl de la Fuente and Damian Nenow, selected for Perlak following its premiere in the Cannes Official Selection out of competition and winner of the City of Donostia/San Sebastian Audience Award. La noche de los 12 años (A Twelve-Year Night), selected for the IV Europe-Latin America Co-Production Forum and presented in Horizontes Latinos following its premiere in Venice, carried off the Goya for Best Adapted Screenplay. Cold War, presented in the Perlak section after its premiere in Cannes, landed the Goya for best European film and Roma, also selected for Perlak, after winning the Golden Lion in Venice, was named Best Foreign Film in the Spanish Language. La enfermedad del domingo (Sunday's Illness), screened in the Made in Spain section after its premiere in the Berlinale’s Panorama section, was acknowledged with the Best Leading Actress Award for Susi Sánchez.